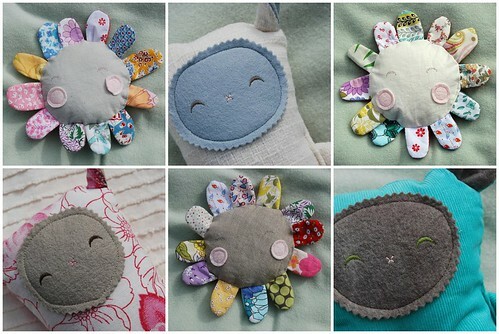 new little fellas now in stock in my esty shop! actually, i updated a couple of days ago and forgot to post about it, i'm a bit slooooow this week. shop updates are going to be a bit sporadic for a few months as i'm heading to toronto for the last two weeks of august for work and then will be visiting family in edmonton for the first week of september. i probably won't add new goodies until october 1 but then i'll add heaps of all varieties of soft toys plus laptop sleeves and a few new treats! in between, drop me an email if you have a special request or order and i'll see what i can do for ya. they wouild make awesome bedrail buddies to give as gifts to sick family members or friends in hospital.... can u attach them to the bed at all?? funnily enough, j + i will be in edmonton at the beginning of september, too...lots of family + friends to visit. have a wonderful trip! You make such adorble things.